The IRC-2000 Integrated Reader Controller allows control of two access control points (doors). It utilizes flash firmware for easy upgrades, and employs fully distributed intelligence for off-line operations. Decisions such as access level changes, schedule activation and card expiration are made by the IRC-2000 controller without the need of a computer. The panel contains on-board clock and memory backup as well as thermal overload protection. IRC-2000 supports fully supervised communication via RS-232, RS-485 and TCP/IP with selectable communication speed up to 56.6Kbps. Connect to the Integra32 Server PC via LIF-200 TCP/IP Gateway, RS-232 cable, or a USB to 485 converter, for a total of up to 16 panels per controller network. 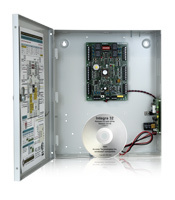 Each IRC-2000 Intelligent Reader Controller has a capacity of storing 5,000 unique 10 digit card numbers, 10 unique site codes and 3,000 off line transactions in its event buffer. 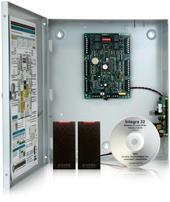 In addition each IRC-2000 Intelligent Reader Controller can simultaneously read up to 5 distinct Wiegand or Clock & Data card formats. The 8 fully programmable four state monitoring, NO / NC supervised inputs & 8 fully programmable Fail Safe / Fail secure outputs (4 x 5A @ 30VDC SPDT dry contacts and 4 x 12VDC 100mA electronic drivers) makes the IRC-2000 a perfect building automation tool. 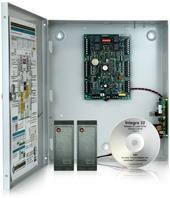 The IRC-2000 Intelligent Reader Controller includes a lockable metal enclosure and a built in 2A 12VDC power supply. Also available as a convenient KIT. The RBH reader KITS are available with RBH standard - and multi-prox proximity card readers. 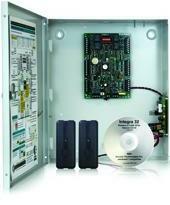 All KITS include SOFTWARE, CONTROL PANEL and PROXIMITY CARD READERS. The AWID reader KIT includes AWID's SR-2400MP multi-prox proximity card readers. All KITS include SOFTWARE, CONTROL PANEL and PROXIMITY CARD READERS. The HID reader KITS are available with HID's PoxPoint proximity and R10 iClass smart card readers. All KITS include SOFTWARE, CONTROL PANEL and PROXIMITY CARD READERS.